Air masses are classified according to the regions where they originate. They are large bodies of air that take on the characteristics of the surrounding area or source region. A source region is typically an area in which the air remains relatively stagnant for a period of days or longer. During this time of stagnation, the air mass takes on the temperature and moisture characteristics of the source region. Areas of stagnation can be found in polar regions, tropical oceans, and dry deserts. 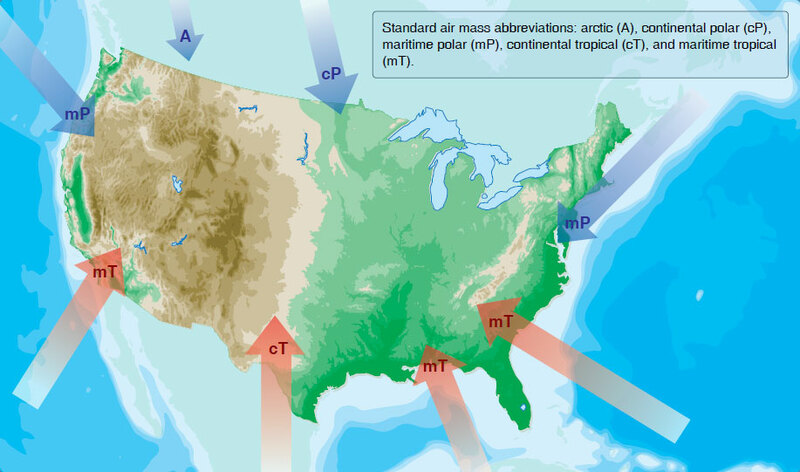 Air masses are generally identified as polar or tropical based on temperature characteristics and maritime or continental based on moisture content. Conversely, an air mass passing over a colder surface does not form convective currents but instead creates a stable air mass with poor surface visibility. The poor surface visibility is due to the fact that smoke, dust, and other particles cannot rise out of the air mass and are instead trapped near the surface. A stable air mass can produce low stratus clouds and fog.